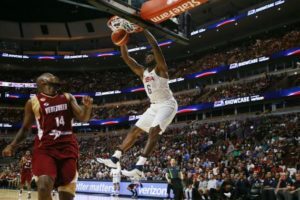 On Monday night, the United States will play Venezuela in their second match of the men’s basketball tournament in the 2016 Rio Olympic Games. This game should be more exciting than the last. They will want to keep in shape, since the United States had an easy time running over China, 119-62. The US are averaging 119 points on 51.4 percent shooting and is allowing 62 points on 35.7 percent shooting. Kevin Durant is play his A-game, he is averaging 25 points and six assists. Teammate Paul George is averaging 15 points and three rebounds. All-star DeMarcus Cousins is the third player in this line of double-digit scorers. DeAndre Jordan is chipping in by grabbing seven rebounds. The United States is shooting 37 percent from beyond the arc and 73.3 percent from the free throw line. Their defense is strong since Team USA is only allowing 29.4 percent shooting from deep and is stealing 52 rebounds per game. The United States will remain unbeatable if they continues to shoot 59.6 percent for two-point shots. They won’t need the field if they can sustain that kind of up close offense. Venezuela will look to try to bounce back and make up for a lustre-lacking performance after taking a beating from Team Serbia, 86-62. Venezuela is averaging 62 points on 37 percent shooting and is allowing 86 points on 57 percent shooting. Gregory Echenique is helping out his team by averaging 12 points and five rebounds, while José Vargas is averaging 12 points and one assist. Néstor Colmenares is their third double-digit scorer. Gregory Vargas has added in his five assists. Venezuela is shooting 18 percent from beyond the arc and 71 percent from the free throw line which should get them some points. Venezuela is allowing 35 percent shooting from deep and is grabbing 25 rebounds per game. With those stats they know they have to play up to their abilities but Venezuela also knows they can’t possibly play any worse than they have in their opening match. Venezuela will definitely be a bigger test for the US than China was, that’s without a doubt because it’s a team with size and has some players who know how to shoot and sink from the outside. But the US won’t be sweating it for too long because they have so much depth. And that depth is what’s going to anhilate teams in this tournament, and so it’s a sure bet that Venezuela won’t be able to hang in there for long. Our Pick: United States wins by 18 points.